The kid - well, maybe not a kid, but a twenty- or thirty-something - said his name was Comiskey, and I'll be damned if, without any encouragement, he produced his driver's license to prove the veracity of his claim. "You the grandson of Chuck Comiskey?" I asked, referring to the last of the long line of the family that owned the White Sox from 1900 until 1959. "No, I'm his great, great, great nephew," came the robust reply, making me think he was going back to the original Comiskey, Charles A., otherwise known as the Old Roman. No matter because all the fans, including more than a few of the North Side variety, sitting around us behind home plate in the upper deck at The Grate on Friday afternoon took notice when the guy unfurled the large "L" banner while the athletes from both sides of town were preparing for the first pitch in what was to become an enticing 10-4 White Sox triumph. Despite a publicized family feud with his sister Dorothy over ownership of the team - Chuck controlled only 46 percent of the stock - Chuck's image was of a refined, you might say elegant, adult. He always wore a coat and tie. His hair never was ruffled. He was polite and well-mannered. Apparently the taciturn gene in the family has weakened over the past few generations. At least one might make that assumption judging from three hours spent sitting a row in front of the Comiskey described here. Please understand, this is not a complaint. We're talking about White Sox fandom in its most fervent form. The support for the Sox and the disaffection for the team on the other side of town were uninterrupted for the entire afternoon. With Milwaukee threatening in the background, the game was meaningful for the Cubs. It shouldn't have meant much for the White Sox, but, in actuality, it did. The entire tableau seemed more like Opening Day than a late September encounter for an aspiring team 32 games below .500. Attending 20 to 25 Sox games this season, we had failed to venture to the upper deck. There has been no need since plenty of good seats always are available downstairs. However, the weekend series with the Cubs drew the season's three largest crowds. 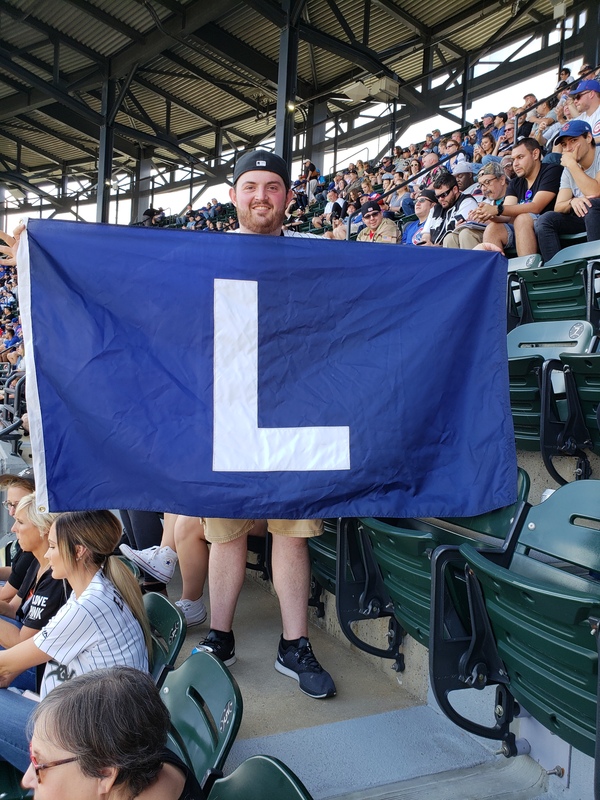 Aside from the Sox's 10 runs and a season-high 19 hits, the lone victory in the three-game set was noteworthy for what was going on in the stands, illustrating the differences between The Grate and Wrigley. When Daniel Murphy drilled a 3-2 pitch from Reynaldo Lopez just inside the right field foul pole for a first-inning leadoff home run, the ball remained where it landed. Granted, a Cub fan might have caught the blast, but Sox fans simply refrain from throwing the opponents' homers back onto the field. I've been going to ballgames for more than 60 years and never once have I collected so much as a foul ball. I am neither proud of this inadequacy, nor have I ceased to chase a ball today if I think I have any chance of correcting this deficit. Players today toss balls to the fans as though they're doling out lollipops, but a big league ball coming from the field of play remains a coveted prize. Just about every kid and many grown-ups understand the thrill of leaving the ballpark with a game ball. So do the Cub fans in the bleachers who carry a ball into Wrigley Field in case they need to follow the crowd by returning a foe's home run to the field. Sox fans know a souvenir when they see one, regardless of whose bat produced it. Perhaps because the White Sox are non-contenders, their fans don't become overly stimulated when a pitcher like Lopez gets two strikes on a hitter with two outs and runners on base. At Wrigley fans get up and down like they're in church or synagogue. Not so on the South Side. In the top of the fourth on Friday, a single and an error put Cub runners on first and second with one out with the Sox holding, for them, a precarious 3-1 lead. Jason Heyward flew out, and Lopez had a full count on Victor Caratini. Unless a trip to the men's or women's room was required, Sox fans remained seated. Was this because we feared the worst? Was Caratini going to hit one into the gap or, heaven forbid, follow Murphy's lead and put the Cubs ahead? Sox pitchers have walked more batters than any team in baseball. We can be excused if thoughts of ball four danced in our heads. But this day was special. Lopez fanned Caratini and went on to shut out the North Siders until he departed after the seventh inning. The game also featured a unique event in the bottom of the sixth with the Sox holding a 4-1 lead. Friends of mine whose allegiance to the Cubs match my feelings for the Sox have told me that Poppa Joe Maddon has lost his touch, and he proved it Friday. After Welington Castillo singled to lead off the sixth, Maddon strode to the mound to remove former Sox number two Jose Quintana with DH Kevan Smith coming up. Even though Smith had hit a three-run homer, just his second of the year, off Quintana in the second inning, surely Maddon must have realized that Ricky Renteria would counter with Daniel Palka if Poppa summoned a right-hander. Consider that Palka already had slammed three pinch-hit home runs this season. Of his 26 round-trippers, 24 had come off of right-handed pitchers. In the previous four games, Palka had amassed a quartet of home runs. Yet Maddon decided he liked the match-up of righty Dillon Maples facing Palka rather than Quintana, or another lefty, going against Smith. Thus, according to form, Palka took a 2-2 pitch deep into the right field stands, and the rout was on. By the way, the ball was not returned to the field. A Sox fan must have caught it. We all know how Renteria was summarily dismissed by the Cubs in favor of Maddon in 2015. For this one instance, Renteria came out on top. Of course, the festivities in the upper deck continued on at a jolly pace. Comiskey and friends partied, dropping f-bombs and pistachios on my wife and our friends with regularity. Previously I had not been aware of the inebriating effects of Bud Light. Obviously volume begins to play a role. The boys must have realized their wayward behavior, offering to buy hot dogs and beer for the ladies which, to my chagrin, were turned down. With a 3:10 p.m. starting time, I was hungry. By the time shadows engulfed the field, three security guards appeared, warily eyeing the revelers. The ladies gave Comiskey a "heads up" which turned out to be helpful. My friend Terry sitting next to me recalled the yellow-jacketed security guys, many of whom were off-duty cops, at the old ballpark. It was wise not to piss them off. Today's guards have rarely been active during this losing season, and they are nattily attired in black shirts, looking spiffy and officious. A few fans in the left field bleachers were escorted out of the park in the late innings, but overall folks got along just fine regardless of which Chicago team is their choice. The biggest winner for the weekend series was the White Sox organization, since the three games drew 113,200, an average of 37,733. The Sox had drawn more than 30,000 just twice during the entire season, Opening Day and Hawk (Harrelson) Day on September 2nd. No one can be surprised that a weekend September series at The Grate hasn't drawn much interest in the past few years. The final appearance of Paul Konerko on a September weekend in 2014 accounted for an average of 32,614 fans, but not since the seasons surrounding the 2005 champions have the White Sox drawn well at the end of the year. Konerko's final season also marked the time when the Cubs visited the South Side for just two games in early May. How shameful was that? The two games averaged less than 24,000. Compare that to mid-August 2015 when the Cubs were headed to the playoffs and the Sox were within striking distance of .500. That series outdrew the one last week by 2,000 admissions. Tonight marks the beginning of the final home series of the year, three games against Cleveland. The upper deck will be near empty. Vendors will be fortunate to sell a couple of cases of beer. Security guards will be kibitzing somewhere out of sight. Things will return to normal.